Creationists and cdesign proponentists often argue that microevolution (changes within a species) occurs, while macroevolution (gradual change from one species to another) does not. Of course, those types are merely in denial of reality, as they are never able to explain what’s going on with this mythical species barrier” they keep positing. The reason for this is, of course, the fact that macroevolution and microevolution are the same thing. This picture (via) stunningly illustrates the fallacy of the “species barrier”. Tetrapod Zoology has a photograph that disproves intelligent design: a babirusa with a canine tooth impaling its skull. An “intelligent designer” wouldn’t do this. Now, I have covered previously how evolution and capitalism operate on the same principles, and hence show that conservatives who reject evolution cannot simultaneously accept capitalism, and I won’t repeat that post here. The key point is that cooperation, as well as competition, drives evolution. The process is called mutualism and is directly analogous to some relationships between entities in an economy, especially comparative advantage. Yet, O’Leary, the poster at UD, seems to be completely unaware of, or in denial about, mutualism. With the knowledge that mutualism does not exist, let’s see what the world is really like. Human gut flora, which reside in our intestines where they help to digest food and synthesize vitamin K in a mutualistic relationship, don’t actually exist. This must be why everyone on the planet is half–starved due to bad digestion and nearly bleeding to death because of vitamin K deficiency. And let’s not forget about the Great Orchid Hoax, perpetrated by botanists and taxonomists for centuries. As orchid seeds do not have endosperm, they are dependent on fungi to germinate, which eventually becomes a mutualistic relationship. However, as mutualism apparently does not exist, orchids do not exist. That’s why all of the 22,000–odd Orchidaceae species are not real, and those gorgeous monocots in the photograph above are just an illusion. Photograph via the Wikimedia Commons. Let’s do an experiment. You will need a photograph of a man who is not bald. The average human head has 100,000 hairs, and for the sake of this experiment assume that this man has exactly 100,000 hairs on his head. Imagine that you pluck one out. He now has 99,999 hairs on his head. Is he still not bald? Of course. There is no significant difference between having 100,000 hairs and having 99,999 hairs. Imagine that you pluck out another hair, so that the man now has 99,998 hairs on his head. Again, this is not a significant change, and the man in the picture is still not bald. Repeat this enough, and eventually you will imagine plucking out the last hair on the man’s head, leaving him with no hairs. If, when starting with a man who is not bald, plucking out one hair at a time never changed a man from being not–bald to bald, wouldn’t this mean that a man with no hairs on his head is not bald? Clearly, our conclusion is unacceptable. We cannot say that no man is bald because our experiment resulted in a man with no hairs on his head, who would be bald by definition. We cannot deny that not–bald men exist, as our experiment started with someone who we agreed was not bald. This implies that somewhere along the line the man went from being not–bald to being bald. When did the man change and where was the boundary between being bald and not bald; equivalently, how many hairs does a man need to have on his head so that, should one be plucked out, he will go from being not–bald to bald? We cannot pick any random number, say 10,000, because this brings up issues of arbitrariness; why not 10,002 or 9998? We cannot defend our choice of 10,000 being the boundary because it is a round number, because 10,000 is a round number because of the numeral base we are using (base 10 in this case). The Ndom language of Kolopom Island counts using base six. In base six, 10,000 is 114,144, not at all a round number. Hence, defending 10,000 as the boundary between being bald and not–bald because it is a round number implies that a man’s state of being bald or not–bald is dependent on the language we are discussing him in. That idea is, of course, ridiculous. Finally, we cannot claim that there are three categories— not–bald, unsure, and bald— because this necessitates asking where the boundaries between not–bald and unsure, and between unsure and bald, are. This therefore reduces to the same problem with selecting a boundary as before. The resolution to this problem is realizing that even though there is no clear boundary between being bald and being not–bald, there still is a difference between them. The lack of a clear boundary between the category bald men and the category not–bald men in no way means that those categories are not distinct. The key point is that a large number of successive differences in degree (plucking out one hair at a time) eventually amounted to a difference in kind (not–bald versus bald). And that is exactly what the difference between micro and macroevolution is. A large number of successive changes (microevolution) eventually accumulate, causing evolution into a new species (macroevolution). So now, whenever you debate cdesign proponentists, you can explain this to them and ask them, if they still accept microevolution but deny macroevolution, why they deny the existence of bald men. Uncommon Descent, a blog dedicated to the pseudoscience of intelligent design, has one of the stupidest things I’ve read in a while. They quote an article from the Toronto Star discussing a process of hybridization between coyotes and wolves in Ontario that appears to be causing the evolution of a new species. Since creationists and IDers falsely deny the existence of speciation through macroevolution, they then claim that these organisms are just hybrids. Uncommon Descent is wrong. Hybrid speciation is a fact. For example, the butterfly species Heloconius heurippa is a species derived from hybridization between H. melpomene and H. cydno (see this abstract from Nature). 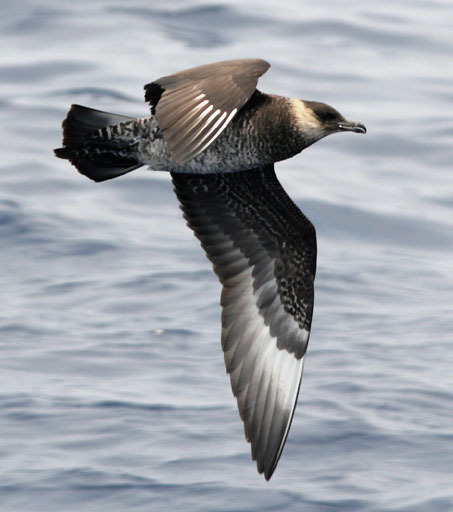 The Pomarine Jaeger (Stercorarius pomarinus), a predatory subarctic Charadriiform seabird, is in many ways intermediate between other jaegers and Southern Hemisphere skuas. There is some evidence that it may be a hybrid of the Great Skua (S. skua) and one of the other jaegers (see this PubMed abstract). Since according to ID, macroevolution does not occur, if the Pomarine Jaeger really is a hybrid, it could not be a species, just a hybrid. However, the Pomarine Jaeger is a perfectly acceptable example of a species, showing Uncommon Descent to be false. Image via the Wikimedia Commons. Just as I expected, dealing with an impacted wisdom tooth cost money. Too much. If this happens to a cdesign proponentist, perhaps they will learn in the most expensive way that humans, every organism actually, is incompetently designed. You know, in a way consistent with evolution, not with a intelligent designer. I don’t think that our change in diet from the Paleolithic serves as an “escape hatch” since surely an intelligent designer (which IDers always associate with God) would have known this in advance and accounted for it.